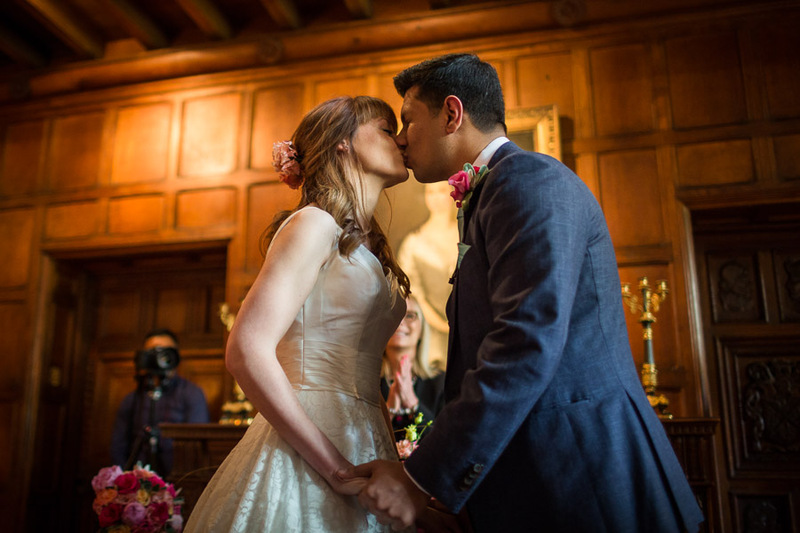 Victoria and Lawrence used the loveliest autumnal touches to decorate their beautiful medieval venue Dartington Hall. It’s the largest medieval house in the West of England and possibly one of the most romantic wedding venues in the South West. 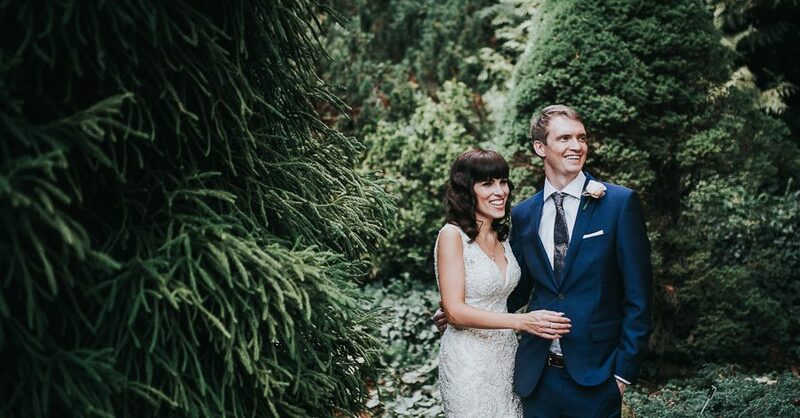 They chose to marry in November because they love the cosy touches they could incorporate into their day: log fires and autumnal colours with rustic touches: lots of dried leaves, pine cones, ivy, burnt oranges, candles… and it looks wonderful! For those of you who love peonies… today’s wedding is wonderfully pretty, romantic and set in the most deliciously landscaped venue. Elizabeth is beautiful – she told me the best thing about being married to Simon is “knowing that day in and day out you will be able to walk with your best friend and share special moments and make memories together.” Isn’t that just so romantic? We chose specifically to have this venue as it did not need much decoration. We only had chair sashes, strands of fairy lights in the main barn from Oakwood Events and goldfish bowls with floating peonies. I do love how weddings give the perfect opportunity to glamour things up to the max. Today’s celebration is beautiful and then some. A statement bouquet, a gorgeous bride in the most fabulous dress, and such a stunning venue! Every detail is just wonderful… I do hope you love this as much as I do! Our theme came from my love of the Great Gatsby, I’ve watched the film and read the book a million times. The whole day from the invitations to the decorations and dress were inspired by the 1920’s era, featuring quotes from the book and patterns from the art deco period. With me being a designer for a living it was really easy to translate the designs from the invitations across to the rest of the theme for the wedding. Happy Tuesday everyone! I have a bright and summery wedding to make your screens happy this morning. The lovely light blues of the wedding are gorgeous, bride Anna is stunning, the venue is crazy-beautiful… there is so much inspiration for you here it’s fabulous! “We had a very blank canvas to work with, which is what we wanted. So we got a few ideas from Pinterest and went with a bright, friendly summery colour palette. Morning lovely! 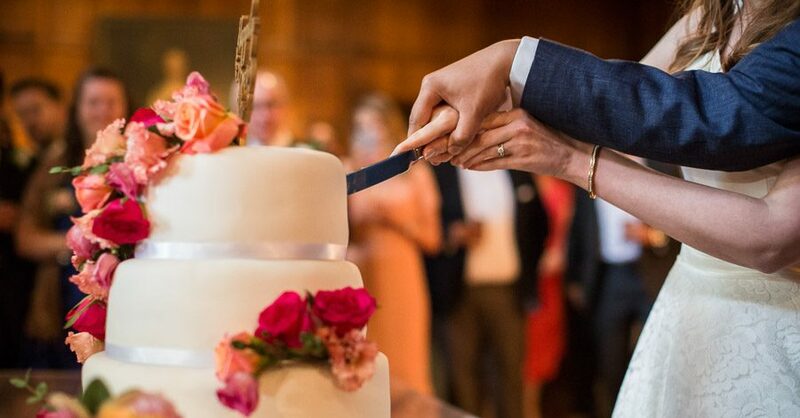 It’s time for a real wedding… and I promise you this one’s a diamond! We have the most beautiful English bride and gorgeous groom – their happiness is infectious. There are the prettiest details, the most romantic moments and the sweetest glances exchanged… my heart might just melt this morning! Deborah’s interview at the end of today’s feature is a classic. It’s full of brilliant advice and tips, with lots of helpful stories especially for DIY brides. I laughed out loud at Deborah’s comment that her big box of gypsophila “smelled like feet” – it soooo does! I’ve always wondered if florists know something about gypsophila that the rest of us don’t! Hey there lovelies! It’s on days like today I wish you were here with me, helping me choose the best of all the gorgeous images I’m sent for every real wedding feature. Because to be honest, today’s Fanhams Hall wedding is so beautiful I’m simply lost for where to begin! Today’s stunning bride Nicola wears a Galina Signature gown from David’s Bridal. She looks incredible with a navy sash belt and crystal hair accessory – and oh, those flowers… nothing provides texture more than fabulous blue thistles and berries, while the roses add glamour and anemones complete the romantic bouquet. LOVE! I can tell Nicola and Adam were inspired by wedding blogs and Pinterest: the chalkboards (and hours learning how to get the lettering just perfect! 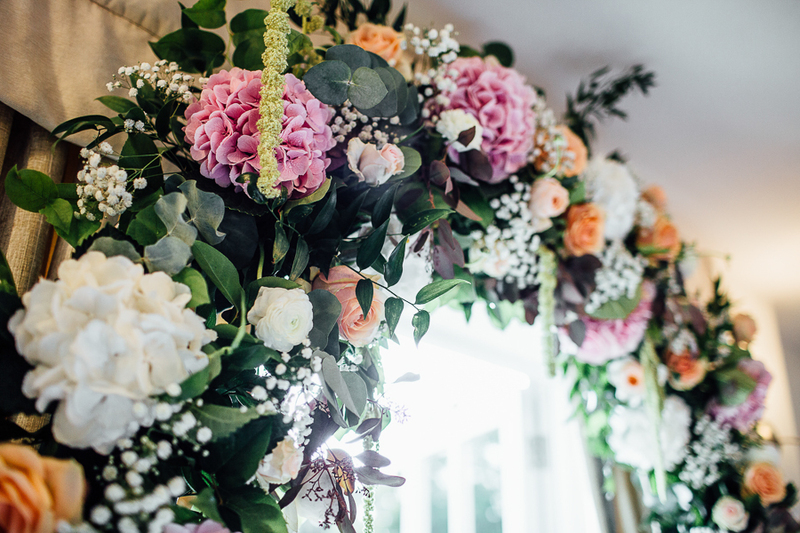 ), anenomes and attention to detail are ideas I love to share on the English Wedding Blog so this blog-inspired wedding is more than perfect!